I bought an apartment in Stockholm in the spring of 2008. I found an apartment in Östermalm that fit my taste and was in the bidding process. I was the only bidder, and I put forth an offer of 2,750,000 SEK. That’s about $410,000 USD with today’s exchange rate, but was closer to $460,000 USD back when I bought it. That’s a big chunk of change, even for a kid from San Francisco. My previous home purchasing experience is pretty limited. I bought a condo in 2005 in California, and that was definitely a learning experience. I never thought I would fill in so many forms, attend so many meetings, sign so many papers, read so many contracts, and pay so much money. But I did, and it taught me a lot about the importance of contracts and floor plans. Naturally, I had the same expectations when I started thinking about buying my apartment in Stockholm. I went to the bank first to see who would give me a mortgage, and how much they’d grant me. I was shocked at how easy the process was. All they wanted to know was how much money I earned each month, and what expenses I had. I didn’t need to send in my last 2 pay stubs, provide my last 3 annual income tax returns, or anything. It was so easy. It’s also really easy to shop for the best mortgage rate. You just go to each bank and ask them to give you the best offer, assuming you transfer all of your business over to them. Don’t be afraid to be pushy – it’s their job to impress you with a good offer. That’s what they are most interested in – making sure your monthly direct deposit goes to them and that you begin a savings account at their bank. That’s about it. Then you get to the actual bidding process. The Swedes are a technologically-savvy bunch. First of all, there is ONE site everyone visits when they look for apartment postings. Not a million separate listing sites. Secondly, you can submit bids online or via SMS. How smart is that? The second surprise comes when you close the deal. It took me a grand total of 7 days to buy my apartment, from the viewing date until I signed the purchase agreement. The purchase agreement was a total of 4 pages. That was it! There was a waiting period before the apartment was turned over to me since the seller had to wait for his new apartment. When it was time to get the keys, I went into the bank with the seller and the realtor and transferred the money over and activated my loan. That was pretty much it. It’s been about 3 and a half years since I moved into this apartment. I am really glad I bought it since the prices in this area have done nothing but go up, so it was a smart investment. I’ve looked back at the process and compared it against the American system and all I can say is that this is a crystal-clear example of the difference between how Swedes do business and how Americans do business. Swedes rely on the laws that are set to protect them, so their contracts don’t need to be long and complex. Thank goodness for that, since my contract was in Swedish and I couldn’t read a single word back in 2008. Americans rely on the contracts to protect them, so their contracts have to include every “if”, “and”, or “but” clause to ensure that both parties are protected. Naturally, this makes every publication a little thicker, a little more complicated, and a lot more annoying. Truly Swedish? I think so. Seeing as this is one of my most popular posts, I thought I’d do an update for my readers. The living situation in Stockholm hasn’t really changed since this post: a) it’s still very difficult to find a place to rent, and b) prices to buy are still high if you want to live in the city center. However, a few things have changed around loan costs and the structure of loans. Interest rates have dropped a lot, and people are using the lower rates as an excuse to go into their banks to renegotiate their loans. Banks are also reducing the amount of money you can borrow – now you can borrow a maximum of 75%, which means you need to have enough cash on hand for the down payment (“handpenning”). For new college grads, new couples, etc – that is a really high barrier to entry. One thing I’ve started to see more and more – or maybe it’s just that my circle of friends has evolved over time – is that people are starting to room together with a friend. I always thought Swedes were against rooming together, but I guess the difficulty in finding rentals has made that a more popular option. Are you in the market to buy? Here are some tips! Shop around at different banks for the best loan and get yourself a lånelöfte. The lånelöfte will give you an idea of how much you can borrow. Don’t be afraid to pit one bank’s offer against another, and go to DIFFERENT BRANCHES of the same bank. They are all different profit centers so you’d be surprised how varied the responses can be. Many banks will require that you transfer all of your financial assets to them (e.g. direct deposit from your employer, your pensions, etc) but you just have to agree to it. Since they know it takes time to do the transfer, you can often lock down a favorable interest rate before you do the actual transfer. If you find a property that you’re really interested in, contact the real estate agent and ask for a “förhandsvisning” – a viewing in advance. Sometimes this gets you in at the right moment, and if you can put in a bid that the seller will take, you’ll avoid a bidding war. Location, location, location. A crummy apartment can always be fixed up. But a bad location is… well, a bad location. I’ve lived in my apartment for 5 years now and I tell you – location is KEY! The closer you are to public transportation, the better off you’ll be, and the easier it’ll be to sell your apartment when it comes time. Pay attention to the månadsavgift – the monthly fee that you need to pay to the association (bostadsrättsförening) – and compare it against other similarly sized properties in the area. That is more or less a fixed fee every month which doesn’t go towards paying down the mortgage, so keep an eye on it. I hope this helps. If you have any other questions, post something in the comments and I’ll respond! Happy apartment shopping! http://www.booli.se is also a good home listing site. Hemnet’s competition. What deposit did the bank require for you to get the mortgage? Was the mortgage something like in the Uk, 3-4x annual gross salary? I put down 10% of the purchase value, the rest was on the mortgage. The rules have changed so you’re required to have 15% down now. Kenneth, I like your blog too. I also interested to buy the apartment in Stockholm but the links which you mentioned no english version (or I may overlook it?). 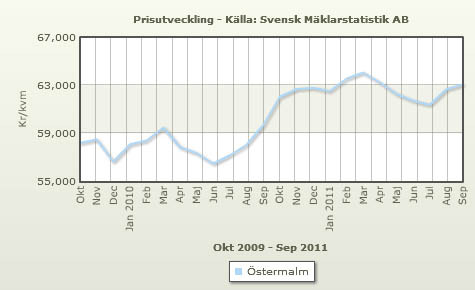 I want to learn more about the property market in sweden. The process seems simple and reliable. I am living in Hong Kong but here is getting more crowded. I am looking for the new place to move. BTW – Could you advise other links about swedish property in english? Panda: You’re right, most of the sites are going to be in Swedish. I haven’t found an English site but I’m sure a little bit of Google Translate will get you started. Hemnet.se is quite easy to use – you just have to specify which Stockholm district you’re looking for, and then specify your parameters (size of apartment, price, number of rooms, etc). Good luck, or post again if you need more help! Thank you Kenneth, one more quick question before I try to do more research. Do I need to create the local bank account in Sweden? or I can use the HSBC global network? I plan to get the apartment there first but I will not move shortly. Generally speaking, you will need to have a local bank account for your bank loan, unless you’re planning on paying cash for the apartment. I don’t think HSBC would grant you a loan for property that they cannot secure (in case of default). THANK YOU so very much for taking the time to write this. So helpful. But one question: does credit rating factor into the ability to get a loan, or is that also an american issue? I’ve googled it but can’t find anything. Yes, they do run a credit check, but it’s not the same kind of credit check as in the US. They don’t assign a score or anything – it’s mostly to see if you’ve got any debts that you haven’t been good about paying. But the down side of that is it’s rather binary – if you have a late payment or anything, you can get denied a loan. what are the reference points for the credit check? I ask because in the US, on US scoring, my credit hasn’t been good. Yes, some late payments! I’m moving to sweden and weighing whether or not I will be able to buy a place! Your credit history in the US doesn’t transfer over to Sweden. Not as far as I know, anyway. They’re more concerned about your future earning potential, actually, so as long as you don’t have any debt or late payments in Sweden, your credit report should be “clean” from Sweden’s perspective. Thanks for your helpful posts. Where are the best areas of Stockholm to buy a flat? affordable price would be 2.2 million for a 2-3 rooms flat for us. Have you found an apartment yet, Reza? Unfortunately, for 2.2 million kronor you are not going to find anything of that size in central Stockholm. You’ll have to look a bit outside the city. OMG Thank you so much for taking the time to post this. Extremely helpful. -What does half a room mean (ie. 3,5 rum)? Like a cupboard under the stairs?! -Are houses/radhus/villas much much more expensive than apartments in Stockholm/Stockholm suburbs? -So in Sweden you have to bid to buy a house/apartment? strange! how does that work? like ebay?!! -What would you recommend is the best way to get to know which area you want to live in? Do you need to just be in Stockholm walking around, or can you do most of it online, and just come in for the viewings? (we live a couple of hours outside Stockholm right now). Hey Claudia and welcome to the real estate market! The .5 usually means that the room is not a legitimate one with closets and such, but that it’s still has some space off to the side a little bit so you could throw some sliding doors on it. They might, if you’re in a house. It also exists in some larger apartments, but you really have to look. I think it has to do with the plumbing infrastructure in the building. In comparison to what? Property is always going to be more expensive in the larger metropolitan areas when compared to the outer suburbs. Apartments are very expensive in the inner city (Norrmalm, Östermalm, and Vasastan). Yes, in a way. You submit your bids by contacting the listing agent. The listing agent goes around until they find the highest offer. They usually display the current bid price on the website of the property as well. After a few rounds, the bidding usually drops to two people at which point you can submit much smaller bids to see if you can outprice your competition. The easiest way is to live in the different neighborhoods, but I assume that’s not entirely possible. Walking around during a weekend is a good litmus test, as is spending some time in the various neighborhoods on a weeknight. Ask your friends who live in the city — what do they like about their neighborhood? What do they dislike? Are those factors also important for you?